It was a time of intense misery for the whole universe, all due to just one powerful demonic person. In complete conformance with the demonic mentality, Hiranyakashipu desired to overthrow Lord Brahma, the Supreme person in the universe from his position and by virtue of irrepressible material strength take over universal affairs. He stood on the tip of his toes erect and still with upraised arms. His determination was to stand like that for many births to gain unlimited power. After 100 celestial years in that posture, a blazing fire, like that of the sun at the time of universal dissolution, emanated from the top of his head and created intense heat all over the universe. 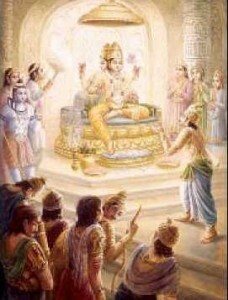 The demigods rushed to Lord Brahma for resolution of the crises. Lord Brahma then decided to go before Hiranyakashipu to know his desires. When Lord Brahma reached the Valley of Mandarachala Mountain, Hiranyakahipu was not to be seen. Without fat, flesh and blood he was buried in an anthill; his life air circulating in his bones. Lord Brahma expressed amazement at his austerity, saying it was an unprecedented performance that would never be repeated in history. Lord Brahma sprinkled pure spiritual water from his kamandalu and Hiranyakashipu immediately rose from the anthill in a strong, lustrous, youthful body, like fire springs from wood. Hiranyakshipu offered humble prayers to Lord Brahma and then revealed the real purpose of performing his severe austerities – the quest for immortality. He asked that he may not be killed by any creature created by Brahma, that he may not be killed by any weapon, he may not die on land, sky or water. He may not be killed inside his residence or outside. He asked for no human or animal to be able to kill him. He further asked for unrivalled control over all demigods and presiding deities of the universe. Lord Brahma granted him his wishes and Hiranyakashipu unleashed a reign of terror in the universe subduing the demigods, transgressing all the Vedic laws and completely dismantling the universal order ordained by the Supreme Lord, Vishnu. Hiranyakashipu bore a deeply inimical attitude towards Lord Vishnu whom he despised for having killed his brother Hiranyaksha. The demigods approached Vishnu for relief from the excruciating conditions. Lord Vishnu said that Hiranyakashipu had brought death upon himself by tormenting cows, brahmanas and saintly persons. His ruin was inevitable and would occur when he would harass his own son who was Lord Vishnu’s exalted devotee. As predicted by Lord Vishnu, Hiranyakashipu inflicted great torture on his own son Prahlada for being a devotee of his enemy. 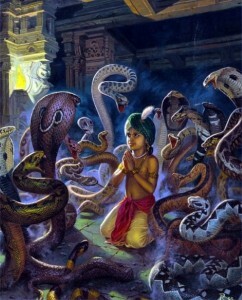 Employing various vicious means and failing, Hiranyakashipu finally took it upon himself to kill his own son. When that happened, Lord Vishnu thunderously appeared as Lord Narasimha, half man, half lion from within a pillar of the palace. 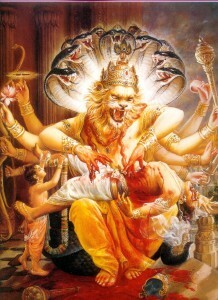 After a brief duel with the demon, at dusk, which was neither day nor night, Lord Narasimha who was neither man nor beast, sat at the threshold of the palace doorway, which was neither inside nor outside, placed Hiranyakashipu on His lap which was not land, sky or earth, and tore apart the stomach of the demon with His bare nails not using any weapons. 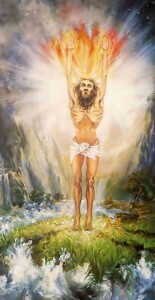 Exhibiting His Supreme Intelligence, the Lord surpassed all the terms of Hiranyakashipu’s benedictions and killed him. 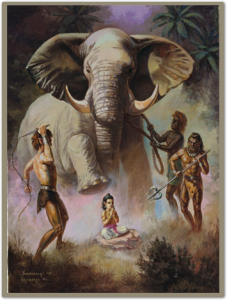 Prahlada prayed for only one benediction from the Lord, to forgive his demonic father and give him salvation. 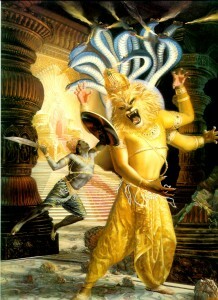 Lord Narasimha said that not just his father but 21 generations would be liberated because he was His steadfast devotee. The appearance pastime of Lord Narasmiha is lesson to non-devotees not to make plans like those of Hiranyakashipu to trick the Supreme Lord for the sake of worldly enjoyment. Modern society, which is busy making plans for sense gratification akin to those of the demon, neglecting to develop devotion to God, will learn well from the disastrous world conditions, that all their plans if not aligned with the will of the Lord would simply proliferate their sufferings. 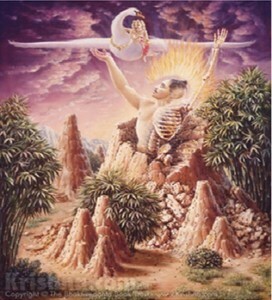 Plans neglecting the Lord’s transcdental purposes in the material arrangement can never succeed. The appearance pastime of Lord Narasimha is a direction to devotees to be firmly fixed in their devotion in all circumstances like the great devotee Prahlada. Constantly remembering the Lord, a devotee can sail over any perilous situation of this world without any harm. It is a strong message to the people of the world to accept the Lord’s infallible protection by becoming His surrendered devotees. It’s hard to locate knowledgeable people on this subject, but you sound like you know what you’re talking about!